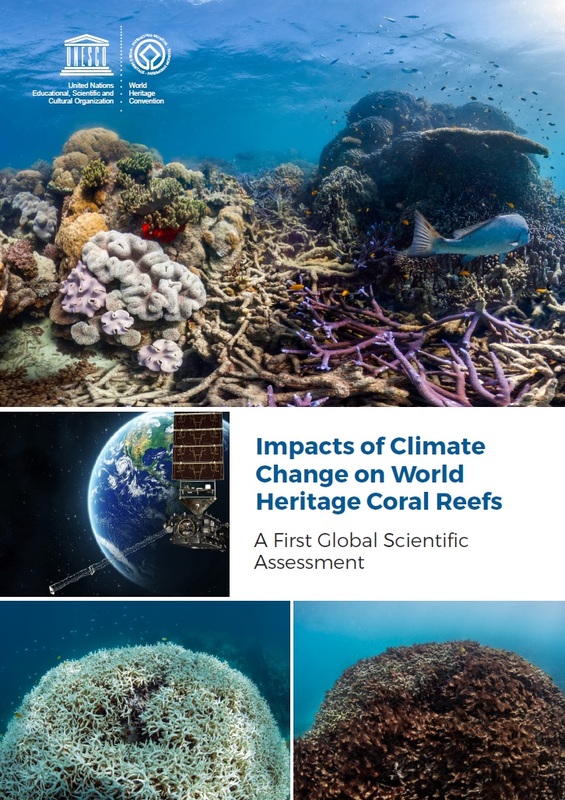 Today, UNESCO’s World Heritage Centre released the first global scientific assessment of climate change impacts on World Heritage coral reefs. Soaring ocean temperatures in the past three years have subjected 21 of 29 World Heritage reefs to severe and/or repeated heat stress, and caused some of the worst bleaching ever observed at iconic sites like the Great Barrier Reef (Australia), Papahānaumokuākea (USA), the Lagoons of New Caledonia (France) and Aldabra Atoll (Seychelles). The analysis predicts that all 29 coral-containing World Heritage sites would cease to exist as functioning coral reef ecosystems by the end of this century under a business-as-usual emissions scenario. Bleaching is a stress response that causes coral animals to expel the microscopic algae (zooxanthellae) whose photosynthesis provides the energy needed to build three-dimensional reef structures. Mass bleaching is caused by rising water temperatures associated with climate change. It only takes a spike of 1-2°C to cause bleaching, and carbon emissions have caused a 1°C increase in global surface temperature since pre-industrial times. This effect has been magnified by strong El Niño and La Niña events. Ocean acidification caused by dissolved atmospheric CO2 weakens corals further. The social, cultural and economic value of coral reefs is estimated at US$1 trillion. Recent projections indicate that climate-related loss of reef ecosystem services will total US$500 billion per year or more by 2100, with the greatest impacts felt by people who rely on reefs for day-to-day subsistence. Widespread coral bleaching was first documented in 1983, but the frequency and severity is increasing. The last three years were the hottest on record, and they caused a global bleaching event that reached 72% of World Heritage-listed reefs. Coral communities typically take 15 to 25 years to recover from mass bleaching. The assessment looked at the frequency with which World Heritage reefs have been subjected to stress that exceeds best-case rates of recovery. It also examined future impacts to World Heritage reefs under two emissions scenarios. The results were sobering and concluded that delivering on the Paris Agreement target of “holding the increase in the global average temperature to well below 2°C above pre-industrial levels and to pursue efforts to limit the temperature increase to 1.5°C” offers the only opportunity to prevent coral reef decline globally, and across all 29 reef-containing natural World Heritage sites. The assessment was developed with satellite data from the United States National Ocean and Atmospheric Administration’s (NOAA) Coral Reef Watch and received the support from the French Agency for Biodiversity (Agency Française pour la Biodiversité).